I am no blogging expert by any means. It has been a little over two years since I started Royally Pink, I've met and spoken with countless bloggers, and have made trials and tribulations on my own. Through all of this, I've learned a few things and have definitely become more knowledgable...still though, no expert. Blogging isn't easy, even though it looks that way. Trust me, before I started I thought it was simple. All you do is write, right? No, that's definitely not what it all entails. Good blog designs, keeping up a social media presence, contacting brands, responding to emails, building a following, keeping your creative juices flowing, finding the time and motivation to open up a blog post, keeping track of your networks, passwords, expenses, ads...my goodness the list goes on and on! Of course, the bigger your blog and the bigger your following, the more difficult these tasks become. I find the hardest part for me is definitely keeping myself organized and coming up with new ideas to write about. I'm a Type A, organizational freak but when it comes to my blog, there are so many ways to keep yourself together and it's hard to figure out what's better. Do you go with a binder, a notebook, a planner, an online tracker, Google calendar, printable calendars, documents, pdfs--what is the right fit? I used to be paper, paper, paper but over the past few weeks, I've recognized the easiness of keeping everything blog related on the computer. 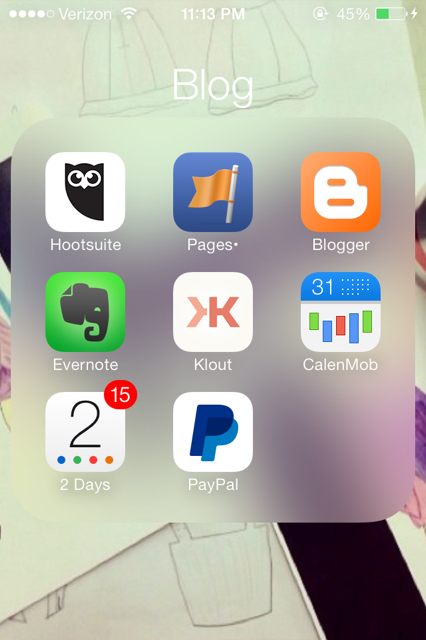 Because of this, I've come to the conclusion that there are a lot of wonderful apps for bloggers to utilize. I've seen a lot of other bloggers write up round up posts like this but some of those bloggers are super big and this is their full time job. These apps that I've been using are more relatable, easier to use and makes sense for smaller, every day bloggers like myself. 1. Google Calendar: This is both an app in the app store and also accessible on your laptop, which makes for easy use and access. I use Google Calendar as my editorial calendar and ONLY my editorial calendar. I used to keep an editorial calendar in my Lilly planner but it was just too complicated and then I tried writing it down in a notepad but this is much easier. I'm able to quickly and neatly change it if things go astray and it's so much nicer to see what I have planned all in one place. It makes it a lot easier to plan ahead too! 2. Evernote: This is heaven sent and I don't know how I lasted so long without it. I've had Evernote for a while but never used it for my blog; the updated version seemed complicated and I didn't want to bother with it but after reading this blog post on how to properly use Evernote, my life was changed. I created a 'Royally Pink' notebook and just have so many notes with random ideas, it's like an actual notebook but so much neater and more organized. I have a running list of ideas, outlines of blog posts, companies to email, etc. I have it installed on my computer, iPhone and iPad so it syncs automatically. There are so many other ways to use Evernote, I haven't nearly made a dent. 3. Eventbrite: This is an app I discovered last summer and it's not just for bloggers. This is an app that takes your location and shows you all the events and conferences that are around you. It's great for networking and niche events that could be helpful to your blog. The best part is that they offer free events and you could buy your tickets right on the app, keeping them in the "My Tickets" section or you could transfer them to your Passbook. It's so convenient and wonderful. 4. HootSuite: This is an app that can get tricky while just starting out but once you understand how it works, you'll adore it. I recently started playing around with it and it's a lot easier than I once thought. HootSuite is an app/website (once again access on a laptop and your phone) that streams all your social media accounts on one screen, making it easy to go back and forth between each. The best part and the most useful to bloggers? You can schedule out your social media posts weeks in advance. If you want to tweet about a blog post more than once over the course of a week, you can schedule them out and drive more traffic to your site. So helpful and useful! 5. 2Days: This is an app that I don't only use for my blog but also for everyday life. It's a To Do list but it has little notifications that tell you how many things you have listed so the red notification bothers you and you want to get rid of them. It's so much better than any other To Do list app I've tried, I'm obsessed. What are your favorite apps for bloggers? Tell me in the comments! !